Maria Prebble is a M.E.M Candidate in Environmental Economics and Policy at Duke University. She holds a B.A. in International Relations and Environmental Studies from Wellesley College. Maria is currently an Environment Gender Index Fellow with the IUCN Global Gender Office. Women are disproportionately adversely affected by climate change, and are often absent from national and international discussions and decision-making. Although “gender” was first introduced in the negotiation text at United Nations Framework Convention on Climate Change (UNFCCC) Conference of Parties (COP) 7 in Marrakesh, Morocco (2001), the 2014 COP in Lima, Peru was only the second COP where “gender and climate change” was specified as a standing item on the agenda. However, despite the recent spotlight on the gendered implications of climate change, IUCN’s Global Gender Office has been providing assistance to international organizations and governments on gender policy, gender equality and women’s empowerment in the environmental arena for more than 25 years. In Lima, I assisted IUCN’s Global Gender Office (GGO) throughout the two weeks as part of a practicum through my university. Since attending the UNFCCC’s inaugural gender workshop last year in Warsaw, Poland at COP19, and through my Environment and Gender Index (EGI) fellowship with the GGO, I have come to understand the significance of gender-responsive sustainable development. In the negotiations, international organizations such as IUCN play an important role in information dissemination and capacity building. 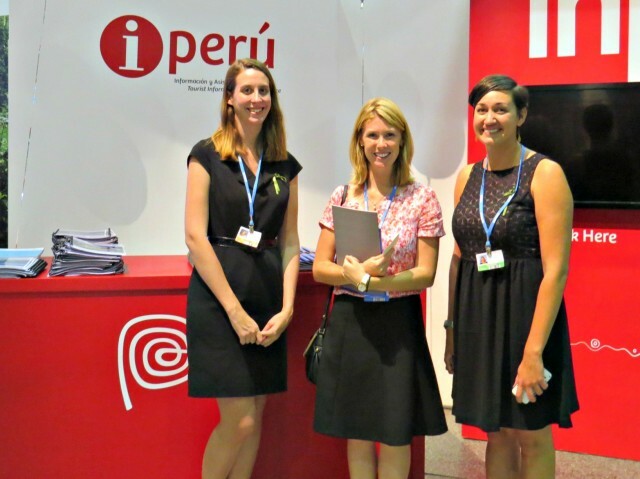 EGI fellow, Maria Prebble (left), and GGO Climate Policy Specialist, Margaux Granat (right), network with Emily Fraser, a Specialist at the Multilateral Diplomacy Programme of UNITAR, at a COP20 Delegates Reception in Lima, Peru. At COPs, “side events” serve as a platform for observer organizations and institutions to communicate climate change issues outside of the formal negotiations. These side events were an integral part of my COP experience, as they provided the opportunity for me to observe policy discussions about a diversity of issues from panels of experts. For example, I attended an event hosted by the IUCN and the Heinrich Böll Foundation on gender and climate financing mechanisms, and an event hosted by the Population and Sustainable Development Alliance on integrating rights-based reproductive health services in climate adaptation. These events emphasized just how interconnected gender is within the facets of the negotiations and the imperativeness of accounting for women’s unique needs, experiences and challenges in program and policy design, and hopefully an international agreement next year in Paris. Just as in environmental decision-making at the macro-level, women are underrepresented in household and community environmental decision-making. Although the COP’s purpose is to construct a global agreement, the outcomes of such an agreement depend on community-based adaptation work on the ground. On this year’s Gender Day at the COP, the UNFCCC Secretariat hosted Momentum for Change, an event that highlighted the contributions women around the world are making towards a sustainable future at the community level. From a water-access project in a rural Indian community to leadership in the renewable energy sector in Thailand, the event showed that women around the world are truly inspirational agents of change, beginning in their communities. In the formal discussions at future COPs, it is critical that gender does not remain an isolated agenda item, but continues to be incorporated into other facets of the negotiations, such as discussions on adaptation, mitigation, finance and loss and damage.